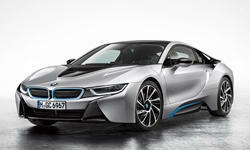 2014 BMW i8 Pros and Cons: Why (Not) This Car? The internal combustion engine isn't dead. But these days an auto maker doesn't demonstrate its technological prowess, at least not to the general population, by developing a supercharged 707-horsepower V8. Rather, the most effective way to demonstrate that you're the most clever auto maker of them all is to offer some sort of alt fuels vehicle that people actually want to be seen in and drive. Cadillac felt it was offering just such a vehicle with the Chevrolet Volt-based 2014 ELR coupe. But sales of the ELR have been dismal even with incentives that have approached $20,000 per car. Then we have BMW. No car maker has been more focused on conventional performance in general and the internal combustion engine in particular than the Bavarian Motor Works. But a few years ago BMW decided that, while it would continue to offer the 3s, 5s, 7s that have served as benchmarks for everyone else, it would also develop a separate, far less conventional "i" range of alt fuels vehicles. So it came to pass that the 2014 model year also witnessed the introduction of the BMW i8 coupe. The i8 is considerably more expensive than the ELR, but good luck finding one discounted. Some BMW dealers are asking tens of thousands of dollars over MSRP for used i8s. While the i8 is about as rare as the ELR, this is by choice. Partly because few i8s have been produced, the car has had the impact Cadillac hoped the ELR would have. Beyond limiting production, what did BMW do so much better? The dramatic layered theme continues inside. A shame that some key touch points are hard plastic. Why the 2014 BMW i8? The Cadillac ELR is a strikingly attractive car. But its styling doesn't indicate that it's an unconventional car. Personally, I don't find the BMW i8 as attractive in any conventional sense. Sure, it's got low-slung, mid-engined supercar proportions, but there's just too much going on in the multi-layered surfacing, with the skin appearing to peel back to reveal the structure beneath it. Conceptually interesting? Absolutely. And many of the details are quite artful. But is the whole beautiful? Not to my eye. BMW clearly tried hard to make the i8 seem like a car from the future. Well, people get excited by a car that looks like it's from the future, especially if its technology delivers on the promises made by the body. The BMW's technology does, beginning with the body itself: it's composed of super strong, ultra-light carbon fiber. Beneath this "life module" an aluminum "drive module" frame supports the powertrain and chassis components. While the largely steel ELR tips the scales at over two tons, the carbon+aluminum i8 checks in under 3,400 lbs., very light for a car with two powertrains and a battery pack. To be fair, the BMW's battery pack is far smaller (and thus far lighter) than the Cadillac's, 7 kWh vs. 16.5 kWh. But one look at the i8's body and people don't seem to care it can't go even half as far in EV mode (15 vs. 37 miles). It turns out that even people who aren't driving enthusiasts get turned on by ultra-quick hybrids. The Cadillac ELR is hardly slow. It can get from a dead stop to 60 mph in about nine seconds with 157 electricity-fueled horsepower, and in about eight seconds with the gas engine chipping in to bump output to 181 (or even 217 in some scenarios). The BMW i8 is no quicker than the ELR when relying entirely on its front-mounted 129-horsepower electric motor. But, unlike the Cadillac's gas engine, which largely serves to charge the battery pack, the BMW's directly drives the wheels. Not only this, but while the i8's primary electric motor powers the front wheels through a two-speed automatic transmission, its gas engine drives the rear ones through a manually shiftable six-speed automatic. Four tires can transfer much more power to the pavement than two can. Plus the i8 packs enough thrust to take advantage of this additional traction. The BMW's gas engine, though only a 1.5-liter three-cylinder, is far stronger than the Volt's 1.4-liter four-cylinder, 228 horsepower vs. 86. Credit turbocharging for much of the difference. Switch into sport mode to unleash a combined 357 horsepower, engage launch control, and the i8 can get to 60 about twice as quickly as the ELR. Very few cars are quicker (though the new 691-horsepower Tesla P85D is among them). Like the ELR, the BMW i8 drives most pleasantly in EV mode. Electric motors deliver their power so smoothly and instantaneously that they feel more powerful than they are. Bringing the gas engine on line nearly triples the amount of power, but it also greatly increases the amount of noise. BMW has electronically augmented the three-cylinder engine's inherent growl. The resulting sound isn't a bad one, but it's not the most thrilling or refined, and I couldn't escape the sense that much of it wasn't real. This is a minor niggle. At least as impressive as the i8's ultra-quick acceleration is how seamlessly the electric motor and gas engine complement each other. It must have taken a lot of fine-tuning to make such a complicated powertrain operate with at least as much refinement as a conventional gas engine. Flying buttresses visually separated from the rear fenders are the most dramatic exterior detail. The BMW i8's handling is less of a draw than its performance, but it's still a draw. The chassis is every bit as competent as you'd expect that of a low, mid-engined BMW to be. Cornering grip isn't tremendous, as tire width is moderate (215 in front, 245 in back) in the name of fuel efficiency, But there's still significantly more grip than in the far less exotic ELR. Plus there's no substitute for the subjective experience delivered by a low seating position. At the same time, I'm less than blown away by the driving experience in the BMW. The i8 feels larger and heavier than it is, and it isn't tossable the way the most engaging sports cars are. You point it, and it goes, with just a hint of understeer pretty much all the time the wheel is turned. But it doesn't feel playful. Add in a somewhat artificial feel to the steering, and the i8 can seem more like a driving simulator than an actual car. Then again, this isn't inconsistent with its high-tech character. Why Not the 2014 BMW i8? The BMW i8's low slung driving position is, without a doubt, a key part of its allure. You can't get a driving position like this without a mid-engine layout. Merely from the view through the windshield you know you're driving something special, even if front seat support and comfort are marginal given the capabilities of this machine. The Cadillac ELR's rear seat is very tight for the average adult, but a couple 5-9 or under can sit back there without outright discomfort. The BMW i8's rear seat is so tight and so vestigial that putting all but the shortest people back there borders on cruel and unusual punishment. I squeezed into the i8's back seat to photograph its instrument panel interior and almost couldn't get out. For those who want an adult-friendly rear seat, the Tesla Model S is far superior to either coupe. The face of i: the twin kidneys's width suggests power, while blue highlights suggest efficiency. Whoever added the cup holders has a sense of humor. You don't want to spend any time here. Exotic mid-engined cars aren't known for utility, and the BMW i8 does nothing to undermine this stereotype. The combination of a front-mounted electric motor and mid-mounted gas engine leaves only five cubic feet for cargo, half the amount in the ELR and less than one-twelfth the amount in the Tesla Model S.
The BMW i8's artificially enhanced engine soundtrack is attended by an un-BMW level of road noise on coarse surfaces. The car's low curb weight comes at a price beyond its high price. The Cadillac ELR's interior is considerably quieter, especially on less-than-smooth roads. For a hybrid to have cred, it must have very good fuel economy. Compared to conventional sports cars with similar performance, the BMW i8 rates well. When running entirely off the battery pack, the i8 rates 76 MPGe (the e for "equivalent") in the EPA's tests. The ELR rates a little better, 82, but they're in the same ballpark. When relying on gasoline, the i8 manages 28 mpg, the ELR 33. A bit of a gap, but the BMW is far more powerful. The gap widens with range on electricity. Because the i8's battery pack is less than half the size of the ELR's, it can power the car less than half as far, 15 vs. 37 miles. The largest challenge to the i8 comes from the 691-horsepower Tesla P85D, with an EPA-rated 93 MPGe and 253-mile all-electric range. 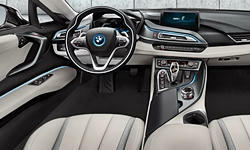 BMW also sought to make the i8's interior appear futuristic, and while the result isn't as avant garde as the exterior, you're clearly not in a regular BMW. Yet I couldn't shake the feeling that the i8's interior seemed overly plasticky. The frequently touched door pulls and shifter in particular lack a premium feel. Despite a much lower price, the Cadillac's interior looks and feels more upscale. The BMW i8's $136,650 base price (before a $3,793 federal tax credit) is nearly double the Cadillac ELR's. Shift to actual transaction prices, and the "nearly" goes away, and then some. Incentives have been as high as $20,000 on the ELR, while people report struggling to find a BMW dealer willing to sell an i8 for MSRP. Packages for the i8, which range from $2,000 to $10,800, are almost entirely composed of trim options. I've yet to find a decent description of what each actually adds of value. Still, judging from demand for the i8, those able to afford such a car don't balk at its price. Its styling, configuration, and body materials are far more exotic than the ELR's. And it's much quicker. And it's a BMW. 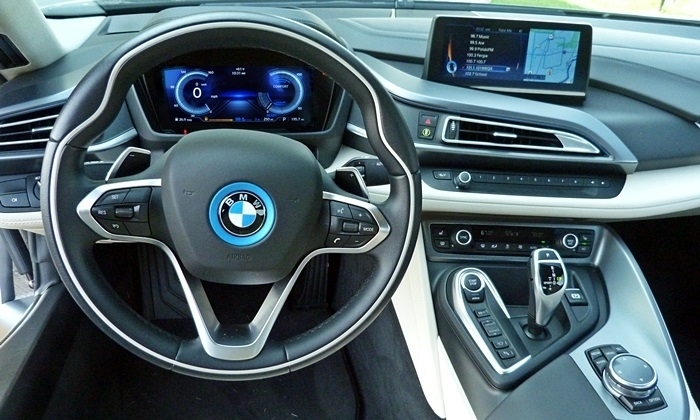 The BMW i8 impresses with its technology and its performance. Compared to the Cadillac ELR, it has much more exotic materials and is far quicker. Sure, the i8 is amazingly hard to get into and out of and too impractical to serve as an only vehicle. But the people who buy this sort of car own plenty of others for daily driving. The Cadillac ELR is a very good car. The Tesla Model S is an outstanding one. But either could be mistaken for a conventional car based on exterior appearances. The BMW cannot be. It looks much different from any other car, and as if it doesn't even belong in the present or the real world. The driving experience follows through on this impression. For those who essentially want to drive the sci-fi future, the i8 is the car to have. 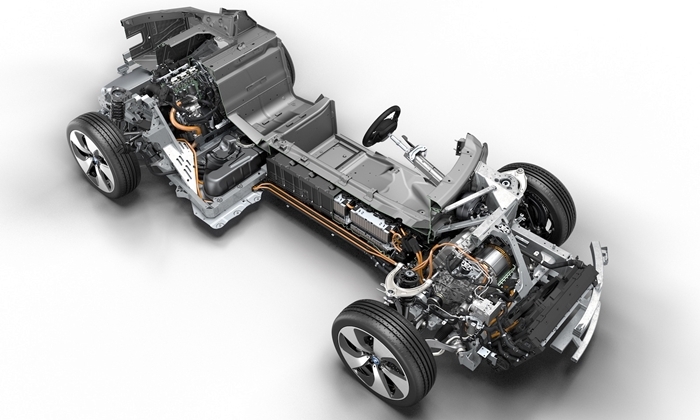 The gas engine, electric motors, and battery pack fill much of the space inside the i8's skin. The trunk does to luggage what the rear seat does to people.The engine lurks inside that cover. BMW provided a fueled, insured i8 at a regional media association event. Cadillac provided an insured ELR for a week with a tank of gas. 2014 BMW i8 pros and cons, according to Michael Karesh: the best reasons for buying (or not buying) the 2014 BMW i8. Join TrueDelta to post your own impressions. I'm not seeing the better / worse graph on this review. Is it just me? As for the i8 I don't get it, but again I don't think I'm meant to get it. Not at $136k. I think I'd rather have a Model S.
No, looks like I skipped that step. Fixed. Interesting Review hopefully Chevy gets there crap together and does make a more Sporty Vehicle based upon the Volt Power Train there is so much potential when you look at the Porche Spyder. I think the i8 is astonishingly attractive, myself. It looks like a hypercar and that has to be what's fueling (pardon the pun) the MSRP+markup sales. On the other hand, I'd want the ELR as a DD commuter; I think it looks great inside and out and its EV performance would work for most of my needs. Yeah, I'd be surprised if more than one in ten i8 buyers were using them as daily drivers (though I did see one on I-94 in the Chicago area recently). The percentage is almost certainly much higher with the ELR.